Delos state that these recordings were previously released on the Russian Disc label, with a copyright date of 1993: that points to RDCD 11067, which features Abdullayev conducting the Ostankino Radio & TV Symphony Orchestra; as Ostankino is the name of the landmark TV and radio mast in Moscow, this is presumably the same outfit. The recordings appeared a couple of years later on Olympia (OCD 491), with the orchestra now labelled the Moscow Radio and TV Symphony Orchestra. There is, alas, no information in the booklet about the Orchestra, but this is the ensemble that started up in 1978, not the one founded in 1930 as the Moscow Radio Symphony Orchestra, now called the Tchaikovsky Symphony Orchestra, its musical director since 1974 Vladimir Fedoseyev. Potential for confusion is not diminished when Naxos, for example, attribute the recordings of the latter to the former, as they do on their website in the case of the Arthaus Musik six DVD box-set of the complete Tchaikovsky symphonies (102119), released in 2008; nor by the fact that the Tchaikovsky Symphony Orchestra also used to be known as the USSR State Radio Symphony Orchestra! 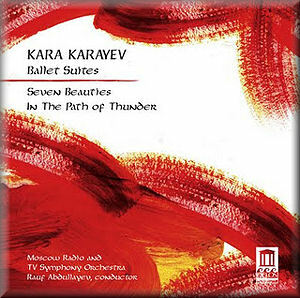 Nevertheless, all Russian orchestras take their music very seriously, and under leading Azerbaijani conductor Rauf Abdullayev, the Moscow Radio and TV Symphony Orchestra, whatever it calls itself or gets called, gives strong, persuasive performances of Azerbaijani composer Kara Karayev's entertaining ballet music. Karayev's name is frequently seen as 'Gara Garayev', the latter a transliteration that more accurately reflects the initial sounds of his names than the old Soviet-based version. In Azerbaijan itself Garayev is known as Qara Qarayev, and there seems no compelling reason not to have left it as that. Whatever the spelling, the stress falls on the second A in each name. From the outset Seven Beauties, reported to be the first ever ballet by an Azerbaijani composer, is reminiscent of the music of the Jazz Suites of Shostakovich, with whom Garayev did in fact study composition. The second and several other of the eleven movements, however, are more like something by Malcolm Arnold or Miklós Rózsa - more in common with 1950s Hollywood than what was going on musically or socially behind the Iron Curtain. The slightly later ballet suite, In the Path of Thunder, is in a similar vein, though perhaps more discerning. The ballet tells the bitter-sweet tale of interracial lovers in apartheid-era South Africa ultimately meeting a tragic end, thereby causing The People to rise up against their oppressors: cue thoughtful, romantic, rousing themes skilfully interwoven into an attractive narrative. Any anticipated exotic/indigenous elements borrowed from South African or Caucasian folk music, referred to repeatedly in the booklet notes, are surprisingly sparse. Even the extended central section of Seven Beauties, featuring five consecutive national dances from as far afield as India and China, is heavily sieved through European musical precepts. Anyone looking for exotica would find more in Rimsky-Korsakov or his pupil Mikhail Ippolitov-Ivanov, both of whom successfully imbued their music with an Oriental fragrance fifty years earlier. Given the stories told by, and the general nature of, the ballet, this is music of grand emotional sweep, cinematographic in that 1950s Hollywood way. There is little subtlety or profundity as such, yet Garayev was, like Arnold and Rimsky-Korsakov, a master orchestrator, and for anyone interested in orchestral colour and drama - not to mention lots of pleasing melody, catchy rhythms and easy-going tonal harmony - from a neglected musical figure straddling two continents, this CD is worthy of consideration. Sound quality is not bad, by any means, but not perfect - there is plenty of clarity, yet still an ever-present suspicion of audio compression. The CD booklet is thin but attractive.